When you’re making an exotic leather project using alligator skin, you want to create something that’s truly unique and exciting. Since every alligator skin project is different, how can you be sure that you’re getting the best skins for your needs? When shopping for an alligator skin, one of the first things you'll want to think about is the size of the skin you'll order. The skins that you buy for your project need to be large enough to fit your panels, while simultaneously getting a cost-effective yield from the skin. For example, say that you order a 35-39cm skin, but your panels are only 25cm wide. Even after taking a extra few centimeters for the edges of the panel, you'll still have a lot of extra skin left over, but not quite enough to fit another set of panels with the same hide. Here, you may want to go smaller to more closely match the size of your panels, or go larger to increase your yield from each skin to fill more panels. Alligator skin is a high-demand luxury item, so supplies of this exotic leather are often hard to find. In particular, the Grade I skins can be particularly difficult to find. While these are the most desirable skins, they are commensurately costlier to buy. Alligator leather is typically available in both matte and glaze finishes. With a matte finish, you get a more natural look, one that can more easily blend with a fashion collection. Glazed finishes, with their shiny exteriors, are great for when you want your alligator leather accessories to stand out and draw the eye. These high-gloss finishes are great for increasing the visibility of nearly any color of alligator leather, but limit them to structured products, belts and small leather goods, as they don't bend and fold as well as matte finishes. Distributors. These specialist resellers buy their skins in bulk from tanneries and store them for resale. The major benefit of buying from a distributor is fast delivery once the sale agreement is finished. However, their selection is limited, which may force you to settle for a skin that’s merely close to what you actually wanted. Plus, there’s a cost markup compared to buying from a tannery. Tanning takes time, adding a processing delay to your skin order. Manufacturers. If you’re having a company handle the manufacture of your exotic leather products for you, they may be able to source the skin needed for your project. Here, you’re relying on the diligence and connections of the manufacturer to ensure the efficient purchase and use of skins. Keeping an eye on their purchasing and use to prevent overbuying is key to staying on-budget here. Keeping the above in mind when you’re making an exotic leather purchase of alligator skin can help you get the most out of your order. 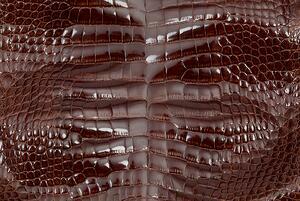 If you need more information about alligator skin, contact an exotic leather expert today!